NASA has a lot of resources providing information on Tropical Storm Harvey as it continues to drop tremendous, flooding rainfall on Texas and Louisiana. Satellites like NASA's Aqua satellite and platforms like aircraft and the International Space Station continue to provide various kinds of data on the storm. "NASA focuses on developing new research capabilities that can be used by our partners in the operational and response communities," said Dalia Kirschbaum, Research Physical Scientist at NASA's Goddard Space Flight Center in Greenbelt, Maryland. "While we continue to innovate in the type of information from satellites, models, and airborne platforms, the main focus is to ensure that the partners that are responding operationally to this event have the information in the format that they need to make effective decisions on emergency response. We continually and actively engage to ensure that the data pipeline is as effective and useful as possible." The International Space Station has provided a view of Harvey from its orbit in space. 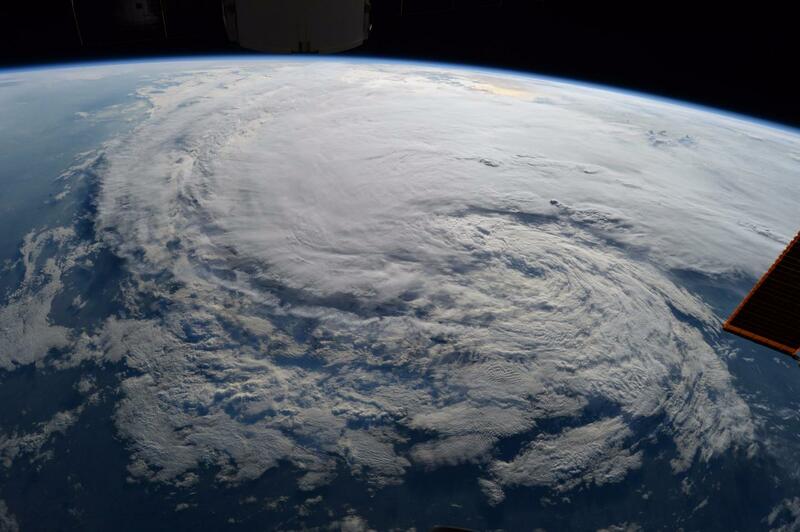 On Aug. 28 at 1:27 p.m. CDT Astronaut Randy Bresnik took a photo of Tropical Storm Harvey. An infrared image taken at 2:29 p.m. CDT (19:29 UTC) on Aug. 28, 2017 from NASA's Atmospheric Infrared Sounder (AIRS) instrument aboard NASA's Aqua satellite illustrated the growing flood threat from Tropical Storm Harvey. The data showed a large area of coldest cloud top temperatures and strongest thunderstorms centered along the southeastern Texas coast. A second area of intense precipitation was visible over southeastern Louisiana. Harvey has reemerged over the Gulf of Mexico, but the National Hurricane Center forecasts only a small amount of strengthening before the storm moves slowly north and inland again. On Aug. 29 at 7 a.m. CDT, the National Hurricane Center (NHC) warned "Catastrophic and life-threatening flooding continues and continued heavy rainfall today is expected to worsen the flood situation in southeastern Texas and southwestern Louisiana." A Tropical Storm Warning is in effect from Mesquite Bay, Texas to Intracoastal City, Louisiana. A Storm Surge Watch is in effect from Port Bolivar, Texas to Morgan City, Louisiana. There are also many flood warnings in effect throughout southeastern Texas and southwestern Louisiana. For specific forecasts, visit: http://www.weather.gov. NHC forecasters said "Harvey is expected to produce additional rainfall accumulations of 7 to 13 inches through Friday over parts of the upper Texas coast into southwestern Louisiana. Isolated storm totals may reach 50 inches over the upper Texas coast, including the Houston/Galveston metropolitan area. Elsewhere, Harvey is expected to produce total rain accumulations of 5 to 15 inches farther east across south-central Louisiana. Rainfall amounts of 5 to 10 inches are expected in southeast Louisiana and coastal Mississippi and Alabama." At 7 a.m. CDT (1200 UTC), the center of Tropical Storm Harvey was estimated near 28.2 degrees north and 94.6 degrees west longitude. Harvey's center of circulation was about 90 miles (145 km) east-southeast of Port O'Connor, Texas. Harvey is moving toward the east-northeast near 3 mph (6 kph), and this motion is expected to continue through this morning. Maximum sustained winds remain near 45 mph (75 kph) with higher gusts. Little change in strength is forecast during the next 48 hours. Tropical-storm-force winds extend outward up to 175 miles (280 km) from the center. The estimated minimum central pressure is 997 millibars. A turn toward the northeast is expected later today and tonight, followed by a turn toward the north-northeast on Wednesday, Aug. 30. On the forecast track, the center of Harvey is expected to be just offshore of the middle and upper coasts of Texas through tonight, then move inland over the northwestern Gulf coast on Wednesday, Aug. 30.